What are conceptual models? What is modeling? What is Modeling Instruction—what is it like for teachers? For students? How does it work? Why does it work? What does it have to do with NGSS? The graduate course, Introduction to Modeling Instruction, will take on these questions and more in a 12-week distance learning course that meets twice weekly, two hours per meeting. We will delve into the cognitive underpinnings of Modeling Theory—reading about some of the seminal theories upon which it is based, engage in Modeling discourse and practice discourse management, watch video of Modeling classrooms and make sense of student thinking by watching them whiteboard and listening to them talk with each other. 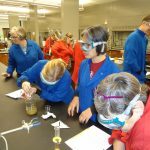 We will look at how Modeling uncovers the spectrum of middle and high school science topics, exploring the storylines from the various disciplines, discussing the fundamental models of each of these disciplines with expert Modelers from physics, chemistry, biology, and middle school science. This is not a Modeling Workshop, but by the end of the graduate course you will have a good grounding in model-based cognition and instruction, and a working knowledge of how Modeling Instruction unfolds in the secondary science classroom. The Distance Learning course can be taken as a graduate course through Dominican University ($100/credit hour) or for a professional development certificate. A $75 non-refundable deposit must be made by December 21, 2018 to secure your seat and full payment must be received by January 15th, 2019.
wendy@modelinginstruction.org. The non-refundable deposit must be made by December 21st to secure your seat. You will be invoiced for the remainder to be paid in full by January 15, 2019. If you would like to pay with Purchase Order (PO) from your school also email wendy@modelinginstruction.org for invoice creation. The PO needs to be delivered by December 21st to save a class seat. Payment for the course by check is preferred. Please contact wendy@modelinginstruction.org with any additional questions.